Before you attempt to deal with moss that’s growing on your lawn, you must identify why it is growing and tackle that underlying cause in order to prevent the moss from returning. Most moss killers sold in shops are totally unable to do this, so it’s far better to call in the moss control specialists from Lawn & Weed Expert. Moss does not have roots, instead obtaining its nutrients from the moisture sitting on the soil. It is probably the single biggest problem for lawns in the UK, but the good news is that moss is easy to kill, especially with the highly effective moss control products that we use. To book a free, no-obligation moss control survey, give Lawn & Weed Expert a call on 0800 111 4958. We remove weeds from gardens in Cardiff, Newport, Swansea, and most other locations across South Wales. 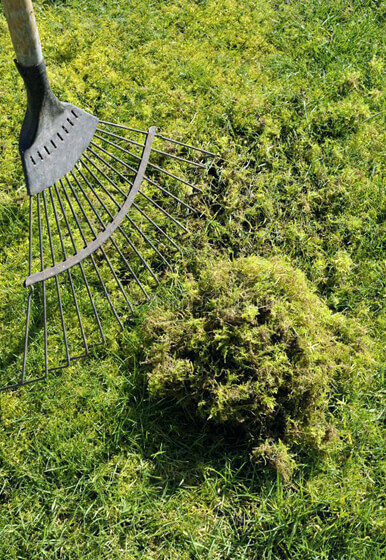 Dead moss must be raked and removed from the lawn, and heavy moss may require scarifying or verti-cutting. If dead moss is allowed to stay on the lawn and turn to thatch, it will stop moisture from reaching the grass roots where it is needed. Thatch also creates damp conditions that are ideal for allowing more moss to develop. Lawns should not be raked / scarified without applying moss control first. You can end up simply spreading the moss spores and making things worse. Be sure to call in an expert to take care of your dead moss for you. Warm, moist weather conditions – These are increasingly common in South Wales and the rest of the UK. Compacted, poorly-drained soil – Heavy soils will become compacted and need to be hollow-tine aerated to reduce the effects of the compaction. Once every 2-3 years, soil can also be top dressed with a 70% sand loam mix to improve soil ventilation. Lawns thick with thatch – As mentioned above, excessive thatch can create damp conditions that are ideal for moss. Scalping / cutting the grass too short – This significantly reduces the health of the grass, weakening it and allowing moss to move in. Not watering the grass in the dry summer months – Again, this can weaken the grass and make it vulnerable to moss. Clay-based soils – Clay soils are prominent in the South Wales area, and unfortunately, they are quite favourable for moss! Shaded or poorly-ventilated lawns – This can make it difficult for grass and soil to properly dry out. Poorly-fertilised lawns with weak and spare grass – Moss is often present on such lawns. If you neglect your lawn for even a short time, moss can quickly move in and colonise large areas, pushing out the grass. Incorrect application of garden moss control products can result in scorching and create bare patches, so why take the risk? Contact Lawn & Weed Expert today for expert moss treatment advice.